What happened: Astral kept the CMLL minis title. Triton beat Cavernario and asked for a title shot. Cavernario accepted it, but only while taking Triton’s mask. What was good: I really enjoyed the minis match, and liked the third match. CMLL’s main event tonight has Los Ingobernables versus Atlantis, Volador and Valiente. CMLL not announcing the Dia de Muetros main event may mean they’re waiting for some angle to set up the main event. The most logical main event is another Sombra/Volador match, so that could come out of that. There are other possibilities. NJPW fans have repeatedly mentioned Naito is not on their current tour; he’s said to both have an ear lobe injury and also not be in Japan at the moment. There’s no sign of Naitro being on any match in Mexico any time soon, but we do know Sombra’s scheduled to be teaming with him next month in Japan. There’s also a small possibility of the first Ultimo Guerrero/Thunder match next week – they meet in the semimain with Terrible, Rey Bucanero, Dragon Rojo and Thunder also involved – but it seems more like they’re saving that for down the line. The Hechicero/Karaoui feud, pushed strongly on CMLL Informa and in interviews, leads to a lightning match between the two tonight. Dragon Lee and Kamaitachi are scheduled to meet in a trios, but Lee’s missed all his matches this week due to injury and seems unlikely to wrestle tonight. The opener has The Panther, Super Comando and Sangre Azteca repeating from last week, where there seemed to be the seed of an issue involving all three. CMLL hasn’t written a preview for this show, instead using the same spaces to promote next week’s Dia de Muerteos show. The show will air on ClaroSports, though your guess is as good as mine if it’ll be viewable in the US. They are also airing a MMA event and the feed has tended to be geoblocked on weeks where they’re airing another event. CadenaTres officially announced it was shutting down last night. The explanation seems to be a scheduled switch over from analog to digital was going to be pushed back to at least New Year’s Eve (because Televisa wasn’t ready), this meant many people would be unable to see CadenaTres for months, and so the parent company decided to shut the whole thing down. They’re saying they’ll relaunch a network “a little more than a couple months” after the changeover happens, though there’s no guarantee the switchover won’t be pushed back again. They’re still working on setting up their new national network, so they’re not going away and will be a factor at some point down the road. All their live shows are saying their farewells today, though SkyTV is listing Cadena Tres as ending on October 26 instead. Might still be worth checking to see if the channel is still running on Saturday. Reforma has an interview with Mistic 2.0, but only a little section of it is available for free. In that, Mistic says he believes AAA didn’t offer him a contract because they thought he was stuck in AAA and didn’t have any options elsewhere. Big Ryck’s agent says Big Ryck hasn’t retired. What happened: Daga & Steve Pain cost Angelico & Jack a win, but they sort of also cost Lider & Pentagon the win and there’s some tension inside Perros del Mal. Myzteziz and Rey Mysterio started feuding in main events and I’m sure that’ll end up well. There’s a mystery person stalking La Secta, an angle I had completely forgotten existed when I finally put up this recap. What was good: Everything! The opener was great (and a surprising Australian Suicide focused match), and the three way tag and the main event were good as well. Where can I watch it: It’s up on AAA’s YouTube channel. 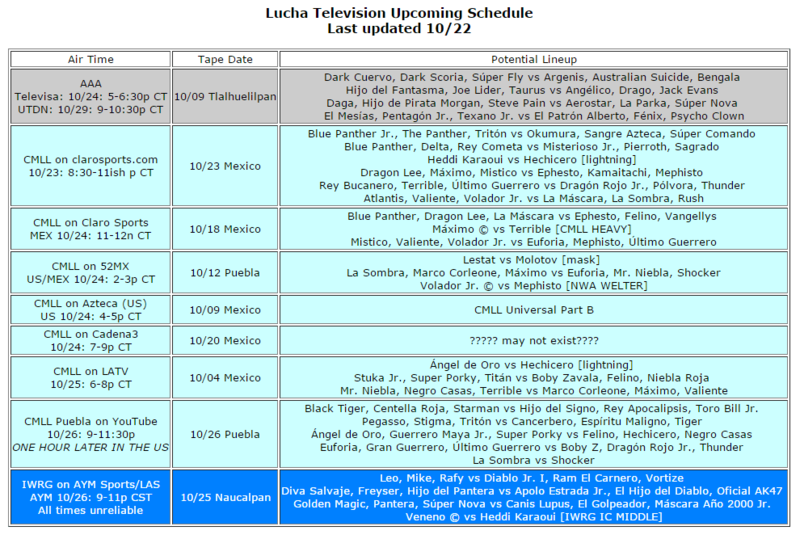 The time change only really affects CMLL on Puebla and IWRG on this week; they’ll both start around 11pm Eastern on Monday if you’re in the US. (Also, change your clocks on Sunday.) It’ll also push back Noches de Coliseo, but that airs at a random time as it is. This is a strangely busy week for Heddi Karoui singles matches, between ClaroSports.com and IWRG.